The current cuesheet is draft 4, dated 5/29/13, with a number of course changes from the 2012 edition. Previously, there was a long stretch on Rt 23 after crossing the Schuylkill River outbound to New Holland. This year, you'll head into French Creek State Park via Rt 724, Red Corners, and a climb up Shed. You'll then travel along Lancaster valley back roads after passing through Morgantown. This is actually a route option we used in previous years which some of you may remember. On the way back, the controle in Limerick has been changed to avoid afternoon traffic on Linfield Rd. About 0.3 miles after the Limerick controle, you'll be passing the Limerick Diner which would be a good place to stop and have a nice sit-down meal. 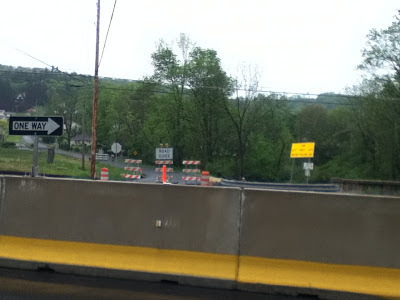 -Mile 37.4: You'll be traveling a rather long way on Rt 724 and this turn is easy to miss. There is a spotting cue before this turn that will help you find it. If you find yourself in Birdsboro, you've gone too far! -Mile 99.4: Course tweak to get you off of Linfield Rd, which is narrow in spots and carries a lot of afternoon traffic. Along with this change, the controle is now a Dunkin Donuts, located in a strip mall 3 miles down this road. -Mile 129.5: Hostel Finish: There will be another large function going on at the hostel and they will be using the big common room. For the finish, we'll have use of the living room on the right as you walk in the front door, where the volunteers will greet and feed you. You will now need to have 2 taillights securely mounted to your frame -- not to a fabric loop on a bag, and not to the back of your jersey (which I've been seeing more of, lately). I also want you to have some sort of redundant headlight but this doesn't need to be permanently mounted. You can carry your spare in a bag. In general, a head lamp attached to your helmet is not sufficient for a backup, unless you have a way of securely mounting it to your bike. As you are probably well aware, the weather forecast is for lots of heat and humidity for this weekend. Given the below average temperatures we've recently had this past weekend, there certainly has not been much time acclimate to the above average heat you'll be facing -- so please take extra caution to keep hydrated and your electrolytes balanced. Bringing along an ice-sock is highly recommended, along with plenty of Endurolytes. Jon Clamp will be signing you in, cooking you breakfast, and sending you on your way. Bill Slabonik will meet you at the finish. Vegetarian chili is on the menu for the post-ride meal. Please note that the registration fee is $25 for this R-12 event, to offset the additional expense of the hostel rental, breakfast, and post-ride meal. If you are staying at the hostel, please get your bunk ready as soon as you arrive, to minimize disturbing anyone trying to sleep. After the event, I encourage you to at least take a nap and rest before getting into your car for the drive home. The cuesheet has been updated to draft 6, dated 5/29/13, with a number of course changes from the 2012 edition. In addition to some minor course tweaks and clarifications, the biggest changes are mainly to day two's 200k out-and-back loop from the overnight controle to New Holland. 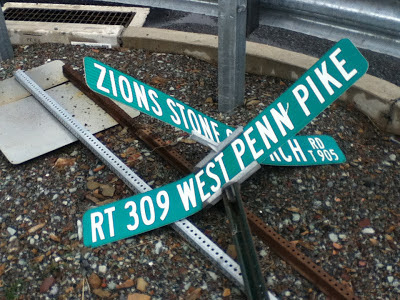 Previously, there was a long stretch on Rt 23 after crossing the Schuylkill River outbound to New Holland. This year, you'll head into French Creek State Park via Rt 724, Red Corners, and a climb up Shed. You'll then travel along Lancaster valley back roads after passing through Morgantown. This is actually a route option we used in previous years which some of you may remember. On the way back, the controle in Limerick has been changed to avoid afternoon traffic on Linfield Rd. 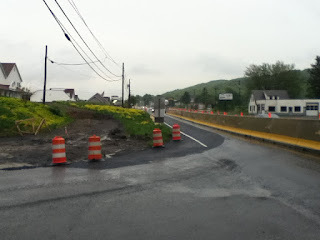 -Mile 74.3: There is bridge construction on Rt 191 that unfortunately is diverting traffic onto Rt 447, where you will be riding. 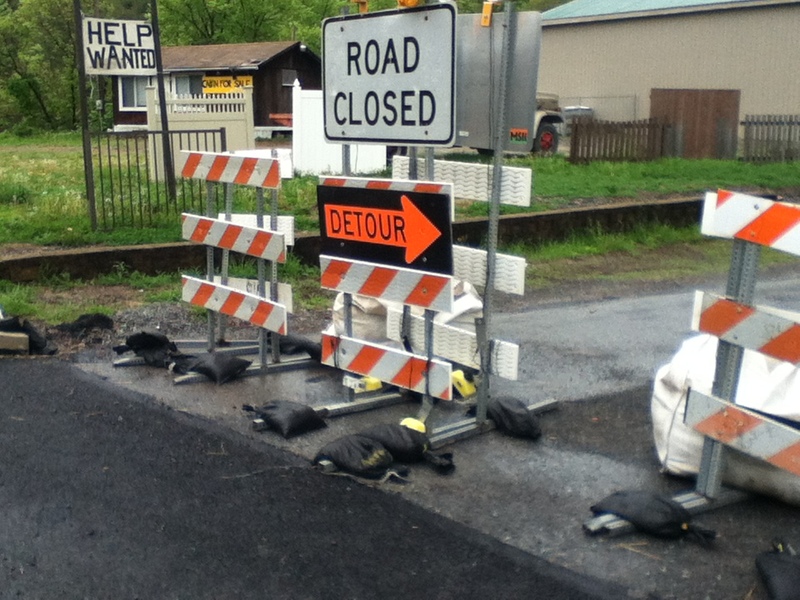 However, it appears that many of the locals were ignoring the "official" detour upon Rt 447 which is very long, and instead using some alternate backroads. -Mile 118.4: As noted on the cuesheet, there is a restaurant here that you can top off your water bottles and maybe pack your first ice sock, as the mid-day heat starts to kick in. -Mile 126.9: You should top off your supplies in Barryville -- you have a 20-mile stretch on Rt 97 that is exposed to the afternoon heat. -Mile 162.6: As noted on the cue sheet, there is a good general store to top off your supplies midway between controles. There isn't much else between Port Jervis and Water Gap. -Mile 202.5: Course tweak that keeps you on Rt 519, instead of the hillier option along Foul Rift Rd. -Mile 240.7: Overnight controle: food and a bunk bed await you at the hostel. If you are staying at the hostel on Friday night, use the same bunk. Otherwise, a volunteer will assign you one. You should plan to be out the door and back on the road for day two no later than 5AM. But leaving earlier would be even better in order to take advantage of the cooler temperatures in the morning. -Mile 279.2: You'll be traveling a rather long way on Rt 724 and this turn is easy to miss. There is a spotting cue before this turn that will help you find it. If you find yourself in Birdsboro, you've gone too far! 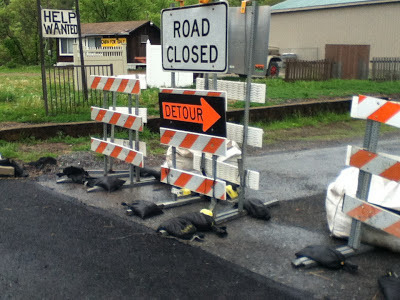 -Mile 342.8: Course tweak to get you off of Linfield Rd, which is narrow in spots and carries a lot of afternoon traffic. Along with this change, the controle is now a Dunkin Donuts, located in a strip mall 3 miles down this road. -Mile 373.7: Hostel Finish: There will be another large function going on at the hostel and they will be using the big common room. For the finish, we'll have use of the living room on the right as you walk in the front door, where the volunteers will greet and feed you. And with the extended amount of riding in the dark that is typical for most riders on a 600k, there is safety in numbers -- so please make an effort to find a riding partner at night. As you are probably well aware, the weather forecast is for lots of heat and humidity for this weekend. Given the below average temperatures we've recently had this past weekend, there certainly has not been much time acclimate to the above average heat you'll be facing -- so please take extra caution to keep hydrated and your electrolytes balanced. Bringing along an ice-sock is highly recommended, along with plenty of Endurolytes. While temperatures are expected to reach 90F in Quakertown, at least the first 200k should be manageable as you head into the cool forests of Promised Land (which typically has temperatures 5 degrees cooler than the surrounding areas). Andrew Mead will be signing you in at the start controle, cooking you breakfast, and sending you off on your way. Jon Clamp and Bill Slabonik will be running the overnight controle. Vegetarian lasagna is on the menu. You'll also see Bill at the finish. In past years, the weather for the PA400k has been warm and humid, making those climbs up those Blue Mountain ridges even tougher. But this time, the overcast skies and moderate temperatures made for nearly ideal riding conditions in the daytime. But those clouds eventually turned to rain during the evening hours -- while the faster riders managed to stay dry, some of the later finishers ended up with a 70 mile slog through the rain. But all-in-all, there can't be too many complaints, especially in light of the 85F temperature and high humidity on top of some rain in the forecast for the next couple of days. Special thanks to volunteers Norman Smeal, Jon Clamp, Bill Fischer, Janice Chernekoff, Bill Olsen and Andrew Mead. Norman and Bill Fischer completed a check-out ride and provided detours for the road construction. Janice manned the start controle, cooked breakfast, and signed in riders while Bill Olsen helped out with bike inspection. Thankfully, everybody was paying attention at the rider meeting when Janice instructed everyone to have "A Safe Ride." Andrew manned the Brownsville controle while Norman spent many hours sweeping the course at Limerick and making sure all the riders were accounted for. And finally, Jon Clamp spent many hours manning the finish controle and making sure all the finishers were well fed. This was a fantastic volunteer crew and the first time the PA400k has been run from beginning to end entirely with volunteers -- a big thanks from an appreciate RBA for all that help! Chris Nadovich writes "...It was a nice change, arriving at Blondie's with some water left in my bottle. Remember that 2010 death march 400K? Yeesh! I'll take cool drizzle over oppressive heat any time. Thanks to the volunteers, especially to Norman who graciously invited me into his warm car at the Limerick controle. Thanks to him, I was able to recharge, warm up, and somewhat dry out before slogging through the final segment with my soggy guardian angel walking along side. .."
Bill Olsen writes: "...Thanks again for staging this event, and especially the volunteers - Janice who saw us off at the early-hour start, and Jon who kept a light on for us as we arrived in through the night, and into the morning, and Norman and the others who were out monitoring our progress throughout the day out on the course..."
Guy Harris writes: "...Norman told Dan, Robin, and me at the Limerick control that we were your missing 3 all day. Seems we were in the crack between the fast crowd and the slow crowd. We did ride together for safety at night though. ... It occurred to me that this 400K route is long enough to have a little bit of all eastern PA rides - the Delaware River, the little ups and downs, Blue Mountain, the little ups and downs, Lancaster and the Amish, the little ups and downs, Quakertown. I particularly noticed the little ups and downs on the fixed as you can tell. Many, many thanks to Janice (for doing her best Tom impression), Norm (for encouraging the last 30miles), Jon (for keeping the club house fire going), and you for the great organization...."
Hugo Safar writes: "... great ride, thanks for putting it together!! It was a perfect day, and a truly beautiful course. And thanks for the volunteers that did the pre-ride, and noted the construction on 309...with the pictures they sent it was clear what to do for a safe crossing. It was also great to have their friendly faces and conversation in the last stops, when every bit of energy and encouragement counted ..."
Ed Dodd writes: "...Thanks once again for organizing another great brevet. It is always an exhausting pleasure to leave the flatlands and come to the land of up and up and up. And, of course, thanks to Janice, Norm, and Jon for all their help before, during, and after the event. ..."
Lane Giardina writes: "..Belated but heartfelt thanks for a great event Saturday. An excellent route, wonderful support from start to finish, and the chance to ride with some folks who'd been familiar names but not so familiar faces made for another special ride. And the chili at the finish was excellent -- after 248 miles I had just enough energy to stop myself from going face down in it. ..."
... as usual, PA members in good standing can register via e-mail by the Thursday before the event. The cuesheet currently posted is from last year, but I'm looking at making some course tweaks to avoid some busy areas near Shawnee and Lancaster. Be sure to check the website and message board for updates. If you are not staying at the hostel after the event, I encourage you to at least take a nap and resting before getting into your car for the drive home. The cuesheet update posted earlier this week (draft 12) is final -- so you can go ahead and laminate it to keep it dry from the chance of showers, currently in the forecast. And with the extended amount of riding in the dark that is typical for most riders on a 400k, there is safety in numbers -- so please make an effort to find a riding partner at night. Please note that the SPOT trackers automatically turn off after 24 hours, so the later finishers will need to cycle the power and enable the tracking feature at some point during the event. Norman will be double checking the SPOTS near Limerick, to make sure they have all been reset near the end of event. - Janice Chernekoff will be checking you in at the start, cooking you breakfast, and sending you on your way. - Jon Clamp will be greeting you at the finish and he'll be serving my new vegetarian chili -- hope you like it! And most importantly, be sure to have a ***Safe Ride ***! Mile 82.6 - Zions Stone Church is closed with a hard barrier and the signpost is laying on the ground. It's unclear why it is closed (we believe they are trying to limit turns during the Rte 309 construction). In any event, riders will need to dismount and walk around the barriers of this unmarked road. Mile 202.4 - The Harmonyville Rd. 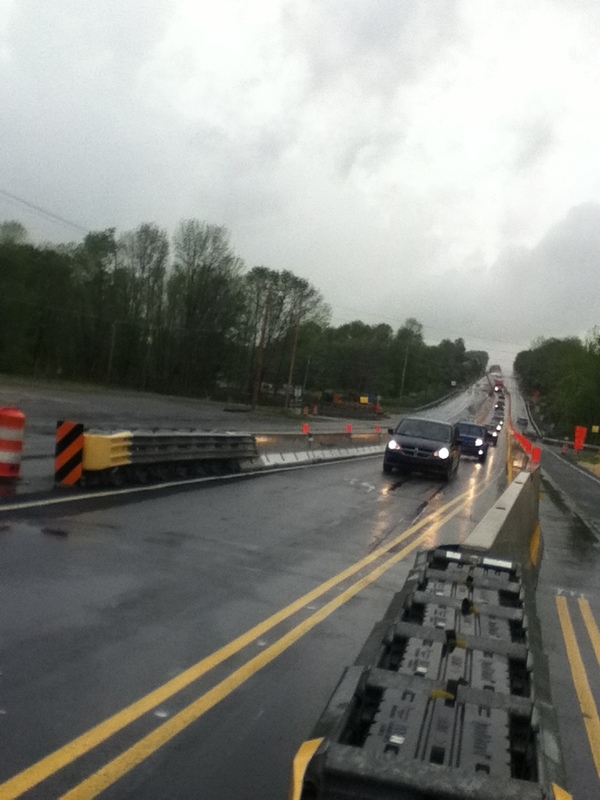 bridge construction is complete and is no longer a detour. Although a bit chilly the start, there can't be too many complaints about the weather which is as close to ideal as you can get in spring. Temperatures at the start were in the low 40F's, but dipped into the 30F's in some of the valley roads. By afternoon, temperatures were well into the 70F's, and the bright sunny skies probably made it feel much warmer than that. That +40 degree swing made it feel like getting all four seasons in one day, as Chris Nadovich quipped at the finish. Of note, Dan Brown completed his very first brevet. Although Dan has only recently returned to cycling, he has already completed a big challenge with this year's Crush the Commonwealth ride, where he met fellow PA Randonneurs, Norman Smeal, Jon Clamp, and Gavin Biebuyck. And thanks to that fortuitous meeting, Dan has discovered the world of randonnuering. Also of note, Flavio Pardo and Gloria Safar successfully completed their very first 300k. Special thanks to volunteers Norman Smeal, Jon Clamp, and Gavin Biebuyck who completed a check-out ride and made sure the cuesheet was as accurate as possible. Norman also manned the start controle, getting breakfast ready, registering riders, and sending everyone on their way. And Gavin manned the finish controle, checking in riders and serving the post-ride meal. Guy Harris, riding a fixed-gear bike, still managed to somehow finish in under 15 hours. Guy writes: "...Many thanks for the ride yesterday. And, to Norman and Gavin for helping out. The climb over High Point and the section down to Stillwater was great..."
200k participant, Janice Chernekoff writes: "..Thanks for a great ride yesterday. The route between Danielsville and Delaware Water Gap was stunning, and I had the best grilled cheese sandwich ever at the pie shop...real bread and cheese and excellent pickles on the side. Please convey my sincere thanks to all of the volunteers as well...."
Unfortunately, although Janice finished the ride, she could not be recognized as an official finisher, since she had previously completed a volunteer ride for the NJ300k, which was also scheduled for May 4th. The rules do not allow you to have two results posted for overlapping events scheduled on the same day. we circumnavigated Katahdin or Springer? Come to think of it, with all the climbing, it sure felt like we did exactly that! ..."
Andrew Mead writes: "...I really enjoyed the latest changes to the Water Gap route. Definitely a keeper! The High Point State Park climb was challenging, but not disproportionately so. The views from the top were spectacular and made it worth the effort. If only that right turn coming off the mountain could have been a little further down the hill so we could more fully enjoy the roll-out. .... Special thanks to Norman & Gavin for superb start-finish work. ..."
Robin Landis writes: "...Just a quick note to thank you for offering a great 300K yesterday! The weather (for which I give you full credit) couldn't have been better. The route was spectacular, and the spring scenery--flowering trees of all varieties, forsythia, daffodils and tulips--spectacular. As we have come to expect, the cue sheet was exemplary--even I, the poster child for directionally challenged people, didn't manage to log any bonus miles on this brevet. I had great riding companions--Andrew Mead, Jeff Butts and (at controles, when we managed to catch up to him) Guy Harris. I especially want to thank Norm and Gavin for their efforts as volunteers. Norm was bright and cheerful and positive at 3:00 am (no mean feat) and Gavin couldn't have been more welcoming and encouraging at the hostel afterwards. Their friendly faces and cheerfulness made all the difference..."
It was wonderful to see Doug Haluza fully recovered from his January brevet mishap and having him clipping-in again with us. Doug writes: "...Glad to be back, and glad you're glad too. Weather was perfect, and I was not, but I lived to tell about it..."
300k first finisher, Don Jagel writes: "... Many thanks for putting together the 300K brevet this past weekend. The route was thoroughly enjoyable and challenging. After a chilly start that included tights, full finger gloves, a shell, and helmet liner, the day finely turned into a perfect sunny day with dry roads. From the start, a group of us had a pleasantly paced ride to the control in Danielsville. Not wanting to sit too long and let the muscles tighten up before the climb over Blue Mountain, I headed out by myself. By the Water Gap it was warm enough to shed the shell, helmet liner, and full finger gloves. Arriving at the Hainesville control, it was time for a quick lunch. My timing was perfect, as I hit the late morning rush in the deli and had to wait almost 10 minutes to place my order. Then it was time for the tights and arm warmers to come off in anticipation of the Deckertown Pike climb. In the early 90's I spent a couple of years doing detailed field work in that area, and knew the roads well, so was mentally prepared for the multi-pitch climb. The cloudless sky allowed for spectacular views that few would realize are possible in New Jersey. After weaving my way through the spaced-out pedestrian traffic at Space Farm in Beemerville, it was onto the familiar roads all the way back to the Hostel. Arriving at the bridge in Reiglesville, I took a quick look at my cues sheet and realized it was still 14 miles back to the Hostel. For some reason I was thinking it was only 8 miles, but the time passed by swiftly as I got closer to the finish. Many thanks to Norman for starting us off in the early morning. The good hot coffee he had waiting was just what I needed to get going. And thanks to Gavin for greeting us at the finish. It is always nice to see a smiling face congratulating you after a long day in the saddle..."
Local PA Randonneur, Bill Olsen finished the Texas Rando Stampede 1200k. Bill tells me they had adverse winds for much of the ride. Mark Thomas reported on the RANDON message board that he: "...Enjoyed a unique grand randonnee experience at the Texas 1200.... A rolling pack of around 30 randos rode nearly the entire ride together. A few riders were off the front and a few off the back, and a crash 45 miles from the end split the group, but otherwise the "herd" rode hundreds and hundreds of miles together. Although a pack that large was certainly inefficient at controls and other stops, the teamwork and camaraderie displayed in the group provided a joyful reminder of the essential nature of randonneuring. A wonderful group of volunteers provided great Texas hospitality all along the way. Kudos to Dan Driscoll and his merry band for what they created...."
... as usual, PA members in good standing can register via e-mail by the Thursday before the event. Please remember to park you car in the big lot to your right, between the road and the hostel, and be sure to stay on the gravel areas. The few parking spots near the house are reserved. Volunteers, Norman Smeal will sending you off on your way in the morning, and Gavin Biebuyck will be meeting you at the finish. There are 2 showers in the upstairs bathroom, and I encourage you to rest in the dorm before getting in your car to drive home.